A group of U.S. Postal Service advocates have launched a national advertising campaign to push back on the Trump administration's proposal to privatize the mailing agency, warning Americans about potential drawbacks of a non-governmental system. The ad, titled “Keep It. It’s Yours,” comes with a media buy that will air it during high-profile programs such as Meet the Press and Face the Nation. It has backing from the American Postal Workers Union and the National Association of Letter Carriers. The groups are still finalizing the extent of the buy, but it will be in the six figures and include Facebook advertising to reach 6 million people. The ad cautions against a privatized Postal Service, saying it could lead to slower mail, including for packages and medicine, and force customers in rural areas to pay more. The groups launched the campaign in the wake of the Trump administration's push for privatization as part of its governmentwide plan to reform and reorganize federal agencies. The White House said USPS should first place itself on better financial footing, then sell itself off to the private sector. President Trump has also created a task force to make recommendations for improving the Postal Service. The group has delivered its preliminary findings to the president and the administration previously said the final report would be released before the end of the year. Multiple sources involved in conversations with the task force have cast doubt on speculation that the final version will include a recommendation for privatization, but they have yet to see a final draft. 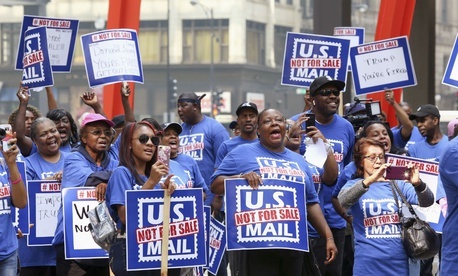 The ad buy also follows a national “day of action” organized by APWU, during which postal employees and lawmakers held rallies in more than 150 cities around the country to encourage Congress to keep the Postal Service public.